The penetrating aroma and the sweet-hot flavor of clove is something that stimulates our senses to the core. Cloves are nothing but the dried and immature flower buds of the clove tree that has an Indonesian origin. Clove trees can live up to a whopping 150 years. The clove oil is known for various medicinal values and the age-old belief of clove oil as a healer has been backed by science. Eugenol is the primary active ingredient of clove oil as it has profound analgesic and aesthetic (pain-reliving) properties. Certain pain receptors are blocked by it and the effect begins after five minutes of application and lasts up to 15 minutes. Clove is a renowned healing agent and even today it is most commonly associated with the oral health and is used by people especially for the achy gums and aching teeth in spite of incredible advancements in dentistry, today. The reason why clove is so effective as a tooth and gum reliever is the fact that it contains benzocaine which is the same stuff used by the traditional doctors to numb an area before inserting a needle. You will recognize this numbing if you ever get clove oil in your tongue. 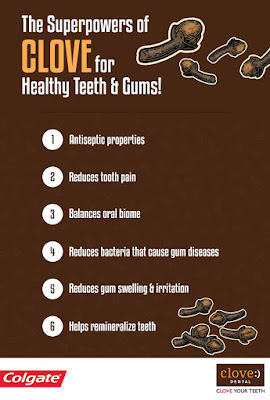 So here are some of the ways in which clove has proven to be beneficial for the teeth and the gums. Clove oil has been serving as an effective relief for toothache since any years now. It has the ability to numb even the most intense pains since the ages. Using clove oil instead of the whole cloves prevents the healthy tissues in the mouth from getting damaged, too. All you have to do is a mix a tbsp. of clove oil and one tbsp. of coconut oil and apply it on the aching teeth. If the problem persists you still need to visit the dentist as the clove oil only helps to numb the pain and does not cure the actual problem. One interesting benefit of clove is that it can help with tooth erosion and decalcification. If you are drinking water with lemon juice first thing in the morning as suggested by your dieticians, then it is especially applicable for you. Opting for acidic drinks and fruits can take a toll on your tooth enamel over time. Clove oil helps to slow down the tooth erosion and thus, supports tooth health. Teeth remineralization is also something that clove oil helps with. That is why now you do not have to go for the excess usage of fluoride that comes with its own set of side-effects including lower cognitive ability and sterility for boosting the oral health. Instead go for clove which is natural, toxin-free, side-effect-free and is demonstrated effective for over thousands of years. Babies who are teething can be quite a handful through no fault of their own. It can turn out to be quite uncomfortable and painful for them to grow new teeth and the clove oil can be of great help. Dilute a couple of clove oil drops in water and apply to the gums of the babies. This will reduce the pain and help them to fall asleep. The germicidal and anesthetic properties of clove oil make it quite effective for relieving a number of oral problems and dry socket which is a painful condition that happens after a painful extraction of an adult tooth is not an exception to that. This because of the strong antimicrobial and anti-inflammatory properties of the clove oil. It is often used as an anesthetic in dental treatments. You can get fresh breath instantly with clove oil. You have to dilute with half tsp. of stevia extracts a couple of drops of clove and two drops of peppermint essential oil. Transfer to a bottle and then you can carry it anywhere you want. Gastric problems can give rise to mouth ulcers that can turn out to be quite painful if not treated in time. Mix a tsp of clove oil with warm water and gargle with it twice a day for getting a relief from these ulcers. As said earlier, clove is rich in anti-bacterial and anti-microbial properties. This assists in killing any germs or infections that may have developed in the mouth due to the ulcer’s open wound. In India, using the clove oil happens to be quite a prevalent tooth cavity treatment. All you have to do is dip a cotton ball in clove oil and keep it on the affected area for a few days before going to sleep. Within a short span of time the cavity will disappear. 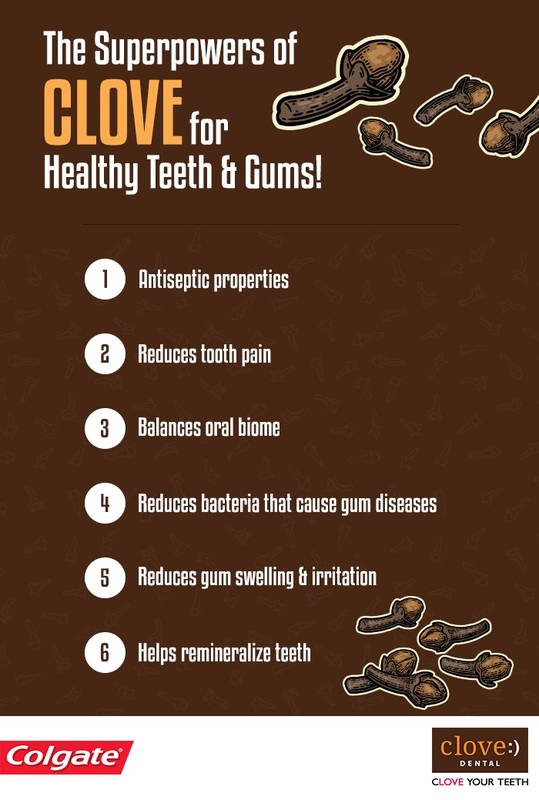 The above are some of the benefits of clove for healthy teeth and the gums. There is a reason why clove is trusted and recommended over the years for the upkeep of healthy teeth and the gums. Now that you know them, turn to clove whenever you are experiencing any of the tooth problems mentioned above to be treated in a side-effect-free manner.